On yet another cold, rainy afternoon in the month of Storing, Hyren sat in his family’s library in their Altador villa, smugly ignoring the inclement weather as a fire roared in the hearth and his family and allies relaxed around him. The blue Grundo’s younger brother Pharazon and Pharazon’s friend Celice were perched on one of the sofas, reading through a stack of books they’d bought during the sorceress’s current visit to Altador, and occasionally making comments to one another about whatever they were studying. Their sister Blynn was—well, Hyren wasn’t quite sure, but the disco Zafara was probably off doing Blynn things like puddle-jumping or baking quadruple-chocolate cookies. Hyren, meanwhile, was locked in a rather intense round of Armada with his owner and the Werelupe King. Hyren enjoyed Armada—it reminded him of his days in Dr. Sloth’s Virtupets military. Virtupets programmers had developed a similar game, and Hyren had purchased it for his electronic devices to relax during rare down times in his operations. It utilised the Virtupets information networks to pit players against each other, and Hyren took pride in his elevated place in the rankings. He’d taken naturally to the game because the strategy involved was similar to what he employed as a commander of troops. At any rate, that was years ago. Now he was playing the pirate-themed version on a real wooden board with little ship pieces. And his opponents were not Virtupets officers, but a brown-haired human woman and an enormous dark-furred Werelupe. Terra had caught on quickly to the game when Hyren introduced it to her, and she was good at it. But she was never terribly interested in actually winning, although she did gain the victory over her Grundo occasionally. Isengrim, on the other hand, had much more of a competitive streak—or at least he did when Hyren was involved, which they both appreciated because they used each other to keep their real-life combat skills sharp as well. Still, Terra was there to make sure the game stayed fun and the two didn’t devolve into bickering children. They still had that problem sometimes. As the owner and Werelupe agreed on a move, Hyren took a sip from his mug of borovan, watching as Terra placed a ship bearing the Jolly Roger in the midst of Hyren’s white-and-red fleet. With a slightly maniacal giggle, she replaced Hyren’s adjacent ships with ones bearing hers and Isengrim’s current colours. Hyren grinned. "A bold move," he said. "Let’s see if it pays off." He reached for one of his own ships to take the opening she and Isengrim had left in their own forces. The library door burst open. "It came!" Blynn shouted. Hyren dropped the game piece, sending other pieces askew on the board, and bit his tongue. His sister always had impeccable timing. Terra looked up from the game. "What came?" she asked. The Zafara scampered into the library, clutching a large postal package. "My copy of the newest Neoquest expansion sourcebook: Secrets of Ancient Shenkuu! It’s got a bunch of new Shenkuuvian-themed content!" Fur still dripping from being out in the rain, she tore open the package to reveal the book in question. Isengrim’s ears perked. "What does that mean?" he asked. 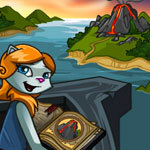 "I enjoyed our first Neoquest campaign. What’s different about this book?" "In our last campaign," Blynn said, thumbing through lavishly-illustrated pages, "we used the original sourcebook, which mostly contained information for ancient Neopia Central and surrounding areas. The publishers of Neoquest occasionally release these additional themed volumes with even more cool stuff to play around with in a campaign. See?" She pointed to an epic painting of a martial-artist Eyrie fighting a Stone Golem in an exotic-looking garden. "New job classes, new skills, new species-colour combos, new enemies, suggestions for new settings…" Blynn squealed. "Okay, I just can’t wait any longer! You guys, we gotta start a new Shenkuuvian-themed campaign right now!" Hyren’s antennae lowered. "Can it wait until I win this round of Armada?" he asked. "I would not be so sure of your victory, brother," Isengrim said with a toothy grin. "Yeah, let us finish this round first," Terra said, helping Hyren place the game pieces back in order, "and then I think we’d all be happy to start a campaign with you." Blynn stared longingly at her sourcebook for a moment, then nodded. "Okay, no problem," she said. "I’ll round us up some snacks in the meantime! Gotta have gaming snacks!" She turned tail and headed for the staircase that led straight to the kitchen—a feature of the home that Terra had been insistent about when they’d built it. "I see Blynn’s really taken to Neoquest," Celice said from the sofa while the three continued their epic naval battle. "We all have," Hyren said as he made his move. "Our first campaign took us about a year to finish, off and on." "We played whenever Isengrim visited," Terra said. "Or when we visited him. We had loads of fun." "I always hear students at Brightvale University talking about it," Celice said, "and there’s even a club for it on campus, but – no offense – I always thought it was a little too… nerdy for my tastes." Pharazon looked up at the bespectacled white Lupe with a smile. "Oh, we’re all nerds here," the faerie Draik said. "Well, I would not exactly consider myself a ‘nerd’," Isengrim said, "but I think it is a harmless and fun hobby. I enjoy going on adventures in a fantastic land, getting to do things that I could not do in real life." "Because we don’t already go on adventures in fantastic lands," Terra said with a wry grin. "Hyren, your move." The Grundo studied the game board, rolling a ship piece between his finger and thumb thoughtfully. "We have been through some pretty crazy adventures," he said. "But ancient Neopia is something else entirely. At any rate, it’s nice to just pretend to adventure sometimes." "True," Terra said. "There were some parts of our adventures that weren’t any fun at all. Like the whole psychopaths trying to take over Neopia parts." "Don’t forget the part where I almost bit the dust," Pharazon grumbled, burying his snout in his book. "We don’t," Hyren said to him. "Trust me. We never will." It was not something anyone liked discussing, and Hyren felt it was a bit unfair, because he never went around reminding people that he had also nearly been done in at several points. Terra cleared her throat a bit, which Hyren knew was her subtle cue that the conversation was getting too depressing for her liking. "Anyway," she said, "we did the right thing and we never gave up, and we’re all here and okay, and thanks to us, Neopia is safe." She smiled. "So I think we have definitely more than earned our right to sit in comfy chairs and pretend to adventure." And that settled that. 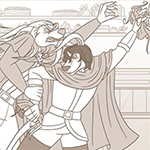 By the time Blynn had returned to the library with a plate of crudités and a bowl of popcorn, and had gathered the necessary pencils, character sheets, and dice, Hyren had won his battle, although it was a very close call. "Hey, we did our best, though!" Terra said as she high-fived her Werelupe. "And we had fun and that’s what counts." "Having fun doesn’t win a real naval battle," Hyren muttered. Isengrim’s ears perked. "She is allowed to have fun if she so pleases," he growled. Terra put a hand on his shoulder and gave Hyren a warning glare paired with a mischievous smile. "If this had been a real naval battle," she said, "I wouldn’t have gone so easy on you." Hyren thought about protesting that he had seen hundreds more battles than she ever had, but at this point he knew it was better to be nice than to be right, so instead he opted for a handful of popcorn. "Well, I’ve decided," Celice said, closing her book and standing up. "I’d like to join your campaign, if that’s all right." "The more the merrier!" Blynn said, passing Celice a pencil, a character sheet, and a bag of dice. "Gather ‘round! Pharazon, you wanna join too?" "Nah, I’m good," Pharazon said. "I prefer one-player games. And waiting for everybody to take their turn in battles seems annoying." "It’s one of the most fun parts!" Blynn said. "That’s when some of the funniest conversations take place!" "To each their own," Terra said as she spilled out her own dice onto the thick wooden table. "Have some good reading time, Pharazon." "I will, thanks," the Draik said as he selected a small stack of books for himself from the pile, and wandered off toward his bedroom. Terra rubbed her hands together. "So what’s new as far as character generation in this expansion, Blynn?" she asked. "Let’s see…" Blynn flipped to the relevant chapter. "Ah—looks like you can finally play as a Vandagyre!" "Then my character will be a Vandagyre!" Terra said, while Isengrim explained the basics of the game to Celice. "How about paint brush colours?" "New colours are… sponge, relic, and candy," Blynn said. "None of which Vandagyres are available in." Terra rolled a ten-sided die around absently. "Gummy rats," she said. "Can Vandagyres fly? I haven’t met one yet so I’m not sure." "The book says they can’t," Blynn said. "Then I’ll be a faerie Vandagyre," Terra said. "That solves that problem." Hyren crunched on a carrot stick and asked, "What about those new classes?" "Right here," Blynn said, turning to the chapter about job classes, many of which seemed to be themed around ancient Shenkuuvian culture. "By the way," Terra said to Celice as the Lupe gazed down at the pages, "I’ve always wondered—how do your spectacles stay on your snout so firmly like that?" Terra reached for her own glasses. "I mean, mine hook over my ears, but yours don’t have side attachments." Celice glanced over at her and smiled. "Good old magic," the sorceress replied. She used her thumb and forefinger to remove her spectacles, then put them back on and wiggled them back and forth a bit. "The nosepads are enchanted to be attracted to bone. It’s a spell used for eyewear for most Neopet species, who can’t wear glasses the way you owners do." "Well, I’d like to try being a relic pet," Hyren said. "I’m going to go all-tank this time—a relic Kougra." "Nice choice," Blynn said. "Sacrificing Mobility for upped Defence, and being a Kougra gives you a Strength boost." Terra pointed to an entry on the page. "I’m going to be a Geomancer," she said. "Those look like fun. It says they use magic that derives its power from all the elements of Neopia, and they specialise in skills that let them manipulate their natural environment to channel or block energy." "Fancy," Celice said. "Geomancy is still taught in Shenkuu, although I’m not sure about its applications in combat. Mostly it’s used nowadays in structural engineering and design." After much enjoyable discussion, everyone finally had their characters figured out and slotted in to the plot Blynn was weaving together. In this campaign, a tyrannical emperor ruled ancient Shenkuu, and he had recently formed an alliance with the corrupted Circle of Twelve that would surely ruin whatever shreds of well-being his subjects still clung to. Terra’s faerie Vandagyre was a scholar of geomancy from the distant Lotus Mountain Temple outside the kingdom’s borders, where the master monk had a dream of darkness consuming the land and sent her to investigate. Hyren’s relic Kougra was a Kaolin General, a special class of military officer who had the ability to create and command living statues made of clay to fight for him. Although the Kougra had loyally served the emperor for many years, the emperor had grown jealous of the Kougra’s growing power and influence and re-assigned him to a remote military outpost away from his allies, and so the general had begun plotting to dethrone him. Of course, Hyren was planning on having his character experience a change of heart at some point and switch to more altruistic motives for his goals. Hyren knew well what that was like. Celice had decided to try being a physical combatant for once, to see what Hyren and Isengrim made such a big fuss about. Celice’s eventide Aisha was a Jade Warrior who used the mystical properties of that gemstone to protect and strengthen her on the battlefield. She hailed from a small farming village that had been taxed nearly to starvation by the emperor, and now the Aisha sought to save her people and make things right. Isengrim had a thing for always playing a Lupe, and this time was no different. His Tyrannian Lupe character was a Mask-Fiend, an unusual fighter who, when he wore elaborate masks depicting various wild Petpets, temporarily gained attributes of those Petpets. This Lupe lived by himself in the mountains and was regarded as something of a monster by civilisation, and in turn he knew nothing of the political intrigue happening far to the west. Blynn, who was great at improvising, had already decided on the basic structure of the beginning of the campaign by this point. She had Terra and Isengrim start first, and the adventure opened with the Geomancer leaving the temple, the only home she had ever known, to journey to the west to find out more about an unknown darkness. Shortly after beginning her journey, the Geomancer happened upon the Mask-Fiend, and quickly befriended him with her kindness and compassion. Although he did not particularly care about the machinations of the emperor or a threat to all of Neopia, the Mask-Fiend did want to protect his new friend, so he traveled by her side from that point on. As the evening wore on, Celice’s character was woven into the tale, and Celice got a crash course in combat when the Jade Warrior was ambushed by a pack of wild Pygui. Thanks to some very unlucky dice rolls, she was about to meet her demise, but thankfully Blynn allowed the Geomancer and Mask-Fiend to come across her and save her. Once they learned of the Jade Warrior’s story and mission, the Geomancer vowed to help her, dragging the Mask-Fiend along in her crusade. Hyren was so wrapped up in the story, and in listening to the conversations between his fellow players, that it didn’t even bother him that his character hadn’t been introduced yet. The Kaolin General would get his chance to shine, Hyren was sure. "I say, this really has been fun of the highest order!" Celice said as they took a brief pause for Blynn to organise her notes and plan the next steps of their journey. Apparently Hyren’s character was set to make his debut very soon. "Thank you for letting me join!" "Any time!" Blynn said. "I’m glad you’re playing with us!" "Yeah, you’re really good at it!" Terra said. "I may have to make this a regular activity when I’m visiting," Celice said. She snapped her fingers. "Ah—we should come up with a name for our Neoquest group!" "I had not considered that," Isengrim said. "You sound as though you already have something in mind." Celice spread her paws. "We’ll be called the ‘League of Adventurers’!" she said. "Doesn’t that sound grand!" "I like it!" Terra said. She thrust her fist in the air. "Huzzah for the League of Adventurers!" "Huzzah!" the others chimed in, even Hyren although it was a bit embarrassing. Still, he was among friends, so he didn’t mind a bit of silliness. Hyren lowered his fist and grabbed another handful of popcorn on the way. Times like these made all the trouble they’d gone through worth it. And the League of Adventurers, when they weren’t out having real adventures, seemed to still enjoy a bit of pretend adventuring in the comfort of home.